Start the engine and stop it after 1 or 2 minutes. Depress the brake pedal several times slowly. HINT: If the pedal can be depressed (to the floor) the first time, but cannot be depressed as far on the 2nd or 3rd time, the booster is airtight. Depress the brake pedal while the engine is running, and stop the engine with the pedal depressed. HINT: If there is no change in the pedal reserve distance while holding the pedal for 30 seconds, the booster is airtight. Depress the brake pedal several times with the ignition switch off and check that there is no change in the pedal reserve distance. 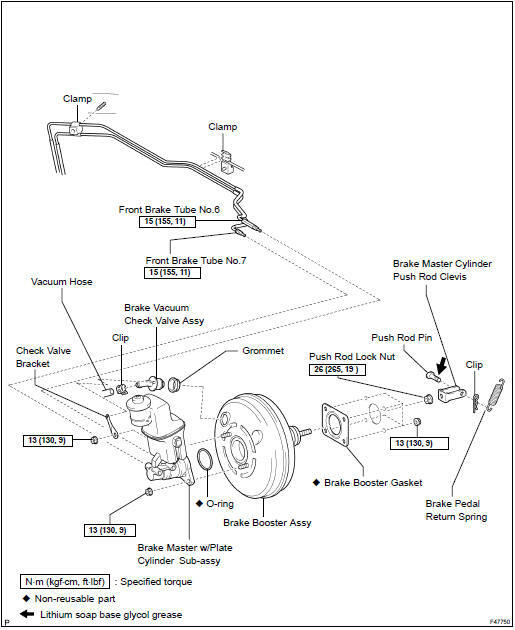 Start the engine with the brake pedal depressed. HINT: If the pedal goes down slightly, operation is normal. (a) Check vacuum check valve. Slide the clip and disconnect the vacuum hose. Remove the vacuum check valve. Check that there is ventilation from the booster to engine, and no ventilation from the engine to the booster. If any fault is found, replace the vacuum check valve.